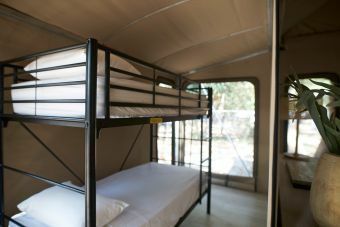 Bedrooms: 2 bedrooms, one queen size bed and a 2 tier bunk in the annex room. 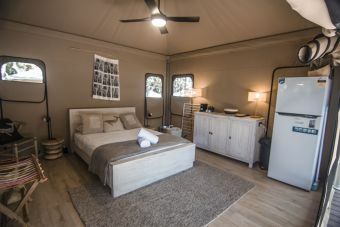 Our eco island tents feature quality queen size beds and linen, exterior decking with large fly windows and doors, canvas shutters that can be opened or closed according to conditions, ceiling fans, tables and chairs, full electric powering, refrigerator and storage facilities. 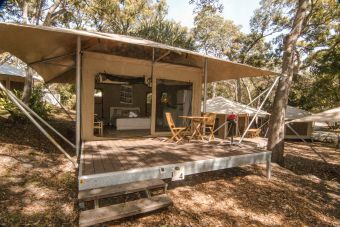 Enjoy a private BBQ on your deck or use the camping grounds’ communal cooking facilities.